The weather forecast was for sunny skies and 14C but the reality was another drab day with cool winds in the open. We met at Rushworth to drive in convoy to Gobarup, about 20kms to the south west. The road was full of promise as we spotted Greenhoods on the verges and Grass-trees on the hills. We drove through a running shallow creek to reach Gobarup, an indicator of the wetter winter this year. These wetter conditions may have saved Gobarup this year as it is slated to be burnt in the push to burn 5% of our forests every year .To this end Don has written an objection to DSE , as has our Club, and other members may object by visiting the DSE website for information. As we parked a couple of canny members spotted the Small-leaved Clematis, shown above. In my urgency to get out of the car and into the bush, I missed the obvious next to the car ! Catherine had a rare plant lists for us, from information supplied by Don, copied from a previous visit by the noted Victorian botanist James Willis, of the Royal Botanical Gardens and Herbarium .They are printed below. The complete list was prepared by Jim Willis and subsequently printed in the Victorian Naturalist 1949 Vol 65. 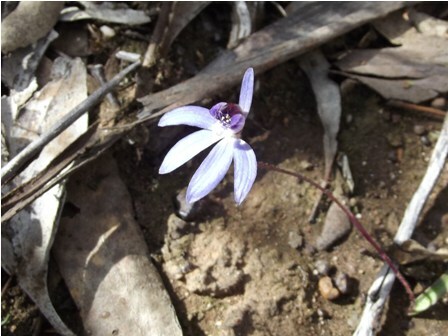 Since Jim Willis visited this area, and after the studies he and other botanists have carried out over the years, some species have been re-assigned, had their names changed or been placed in other families. Some of the changes more recently have affected the names of some orchids so we need to be careful making assumptions as to what certain orchids are now named. .CSIRO have just released a USB stick with all the current info but at $120 I might wait a while before buying –maybe a local library may oblige. This area is known for its mix of Blue and Bull Mallees, those distinctive multi-stemmed eucalypts which are rare in the Box/Ironbark Forest. The bushland was rich and varied and we were soon all looking down and spotting plants .Some of us were hoping to tick off some of the rarer types on the list .Flowering Cut-leaf Daisies were everywhere, vast swathes of Dodonea, the rare Whirrakee Wattle, Acacia williamsonii, still in full flower , Pycnantha in full flower, and the prickly Spreading Wattle .Then someone found the first Eremophila gibbifolia ,the Coccid Emu-bush, a low-growing and spreading form. There was much discussion over Mint-bushes but without flowers we couldn’t confirm some suspected plants. The more common Scarlet Mint-bush is found just to the north of here but later in the afternoon we couldn’t find that either. Another find was Variable Sword-sedge , listed as locally rare but we found it in abundance. Plenty of Dodder-laurel as well. Note was made of the amount of fallen timber providing excellent habitat for invertebrates, reptiles, small mammals and the like but the leaf litter load is very light. 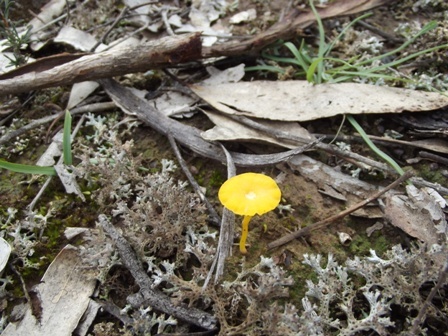 Much comment was made about the various types of funghi, plentiful and colourful, as well as the amount of different lychens. We moved on to eat our lunch and afterward, walk another slightly different area . The lunch area was clearer and the different types of orchids in flower, or just about to, was amazing. 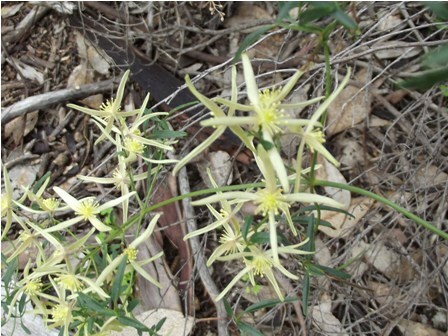 Many of the Caladenia sp. of many different colours were seen. Emerging Leopard Orchids and Waxlips were also seen . Other orchids that weren’t flowering couldn’t be named easily but in a week or two should be identifiable. There was an abundance of flowering Micromyrtus ciliata, the Heath-myrtle, plus Hibbertias, and Common Beard-heath. We even found a Tall Sundew in flower. Grevillea alpina, the creamy-greenish form, was seen close to the track too .Don led us to an open heathland , ringed by Red Box, Grey Box and Ironbark ,more typical of the Box/Ironbark country. A signicant amount of Ploughshare Wattle, Acacia gunnii , a sprawling prickly shrubby wattle , was in flower .We were possibly just a few weeks early for the major spring flowering here on the heathland but the area is beautiful. All the while the birdoes amongst us were busy looking and listening, then taking notes. Flashes of colour had us looking for the Robins flitting around and we heard the call of the Grey Currawong. Despite what some of us thought as a slow day for birds, Peter with some input from others , compiled quite a good list –see below for the species seen on the day. Collier and I spent quite some time looking at specimens of what we thought could be Daisy Bush , Olearia decurrens, rare enough not to have a common name ! After much looking and scrutinising, and looking carefully at Costermans we decided we had found Olearia decurrens, another plant on the rare list. This area also has an abundance of Common Sour-bush .Several other plants were unidentified, difficult to ascribe when not in flower and without a specialised botanical knowledge of this area. As we drove out, my ever-vigilant navigator ( till she falls asleep) called me to stop. 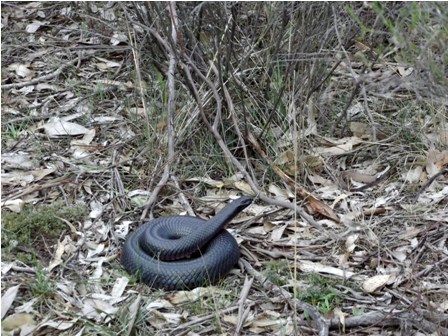 I backed up as Catherine had spotted a fine Red-bellied Black snake coiled next to the track. We got a good look at the snake as it was getting cooler and it was probably a bit slow. I took several photos, one seen here. After leaving the Reserve, Don stopped for us to see some fine Melaleuca sp on the side of the road and spreading in to the nearby farmland. A bit further along we stopped to look for Scarlet Mint-bush but found Lemon Beauty-heads, plenty of Cassinia, one of the Myoporum sp and a spiny plant that could have been Spiny Bitter-pea .A bit further along we slowed to allow several quite large Eastern Greys to cross the road . Another wonderful day in a largely unknown area of the Box/Ironbark Forest –thanks Don for guiding us to this particular part . Bird list for the day —thanks to Peter for the compilation. Hello to everyone and thanks for visiting our Club’s new blog where we will post about our field trips and our club’s other activities. We are a trip-based club and every 4th Sunday in the months of March through to November finds us out in the Aussie bush somewhere in northern Victoria or Southern NSW . We usually have an expert guide with us to give an overview of an area .We then spend a few hours looking at the flora and fauna , sometimes the geology , then break for a picnic lunch somewhere in the bush . Another walk in the afternoon, maybe a cuppa and a report of significant sightings and then it’s off home after a rewarding and friendly day in the great outdoors. A most extraordinary year for the Club as most of our district suffered inundation from the most wide-spread flooding seen in recorded history. Our area has been flooded before and in recent times too, as evidenced by the ’93 and ’73 floods. But this time the waters were surprisingly quick in their rise and pervasive in their spread and the damage they caused . Many of our members were badly affected with some losing absolutely everything they owned .Many were flooded in, or out, of their homes and properties and others had their lives and livelihoods affected for weeks. Roads and other infrastructure across the region are still damaged and the repair bill to us all must be enormous. Many areas still have water that hasn’t drained off affecting farmers’ abilities to productively use that land . Having said that, the effect on the biodiversity of our region is immense. Water birds haven’t bred in such numbers for some years. Refreshed groundwater and subsoil moisture reserves have seen larger trees responding with growth spurts. Understory that has been for some years pressured by drought has responded by putting on sustained growth. Personally, Catherine and I have a seemingly permanent wetland where once we had a dry creek bed running through our property. The birdlife attracted to that water is a source of constant surprise All manner of ducks, egrets, ibis, herons, cormorants, and both types of spoonbill have been seen within 100 mts of our home .A lot of our members have also reported greater than usual sightings of raptors .Many of the robin species, fantails, pardalotes and honeyeaters have been reported in larger numbers too with some rarer types recorded as well. The natural regeneration of native grasses and shrubs is also pleasing after years of losing tube stock plants to drought .Our walk on the day of the AGM through the Wunghnu Common should see this regrowth responding to the inundation. Some species of course have not recovered from the flooding, but with time , residual seed should regenerate. The old adage that ‘every cloud has a silver lining ‘ will never be more true ! Our membership continues to improve and now stands at 77 financial members .This is gratifying as I know that many of us have done their best to invite family, friends, and colleagues and introduce them to field naturalism and the many diverse facets of our area .We continually need to bring in new members as it would seem that field naturalist clubs in general have a declining and ageing membership. Skills and knowledge accumulated over years of study and excursions needs to be handed on to the next generation of members. Many clubs across the State are in serious decline with many unable to continue. Of these Ararat and Horsham are having membership problems and the Southern Riverina and Sunraysia clubs have folded ,unable to attract a younger membership to continue. Timboon Field Naturalist Club hosted the most recent Camp in March 2012 with a membership of 6 ! Their President, also the current President of SEANA, did most of the work single-handedly. My observation of these clubs is that they can sometime become too “scientific” with research and collection of data the main intention of their meetings. Our approach of a field trip led by someone with some experience and a bit of get-together around a picnic lunch and the sharing of anecdotal sightings seems to works for the members of our club. Certainly many of our members have excellent professional knowledge and experiences to share but for some the sheer joy of being in the great outdoors with like-minded people is the point of membership. Let’s continue to invite our guests and build our membership. As you may be aware, I have been elected to the Management Committee of the South East Australian Naturalists’ Association Inc. I am very proud to represent our club and our region at this level and it will give us a voice in the running and policies of SEANA. At the last Committee meeting in early July, the Timboon Club reported on the success of their Camp at Camperdown .In all, 110 field naturalists attended over the three days and the club returned a profit to SEANA of $840 . The next bi-annual Camp is in a month’s time at Bendigo and some of our members have indicated that they will attend .This will give them an insight into the day-to-day running of a Camp and help in the running of our Camp next year in Spring .Next year in March the Peninsula Club will run a Camp based at Merricks with the lower Mornington Peninsula their specific interest. I would encourage all members to seriously consider attending if you can’t get to Bendigo. We need some of our people to experience the Camps and bring that back to help co-ordinate and run our Camp which is only 14 months away. On that point, at today’s AGM I will present to the club the dates I propose for our SEANA Camp for your discussion and approval and subsequent publication. The SEANA Committee also had reported to them that a new Risk Management Policy for all financial members is being investigated and any changes will be discussed at the next meeting. SEANA finances are still very healthy with nearly $43,000 in term deposit and a cash balance of $16,000.At the next Camp there will be a discussion of what may be done with the funds and the suggestion that individual clubs may apply for works grants will be looked at. I have also accepted the role of SEANA Archivist. The Association is now 50 years old and has accumulated an enormous amount of material that needs researching and collating, a subsequent transfer to digital backup, and then, storage. A short history of the Association and it’s member clubs also needs to be undertaken, which I will oversee . I need to thank the Committee , especially our Secretary and Treasurer for the hours of work they do. I see the work Catherine puts in at the computer, correcting my gaffes , and preparing our monthly newsletters for emailing or post. Anne has the responsibility for handling the monies paid in and the accounts going out and I thank her for that. In this day and age, it is not as simple as it used to be. Without Anne and Catherine doing the behind-the-scenes work, our club would grind to a halt ! Thank you both, from us all . We will update the blog in the next few days to include our past outing reports , our calendar for the rest of the year and important information about next years Campout . Our club will be hosting the bi-annual Campout of the South Eastern Australian Naturalists Association when we will welcome field naturalists from far and wide to our district for the first time .The Mighty Murray River will feature highly in our trips with our forests and grasslands to investigate as well . We all look forward to next October with relish.